Imagine a scenario that you are living in 80's or 90's and the phone ringing with a sound "tring tring... " , I Know that you aren't going to imagine that, the reason is we are now living in the Smart Phone Age, Phone Is not just for Calling and Messaging its now become an important part for our life. As you all heard about Linux its an open source operating system for all, most of the Developers and cyber experts are associated with it. Here is a good news Linux Ubuntu launching there phone called as " Ubuntu Phone"
Your Phone will become Pocket PC and It Will run as faster just like your PC.Your phone is more immersive, the screen is less cluttered, and you flow naturally from app to app with edge magic. The phone becomes a full PC and thin client when docked. 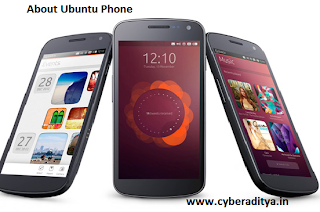 Ubuntu delivers a magical phone that is faster to run, faster to use and fits perfectly into the Ubuntu family. With all-native core apps and no Java overhead, Ubuntu runs well on entry-level smartphones – yet it uses the same drivers as Android. So now it’s easy to bring a better experience to customers all over the world. Ubuntu Phone Consists Everything that a developer needs. Create gorgeous native apps or lightweight HTML5 apps easily with our SDK. Repurpose web apps fast, so they look and work like their native cousins. With one OS for all form factors, one app can have interfaces for phone and desktop – in just one upload to one store. You can receive more updates on Ubuntu Official Website.